The life and times of artist Frida Kahlo were as creatively rich as the vibrant art she created over two short decades. Born in 1907 in Coyoacán, Mexico City, Frida had originally began studying medicine, but abandoned her studies and turned to painting after a serious bus accident left her with multiple injuries. Perhaps her art helped her cope with the bouts of extreme pain she would suffer as a result of her accident. In 1929, Frida married famed painter Diego Rivera, and this is where the storlyine for Me, Frida begins. Coyoacán. It as an invitation to go to San Francisco. Frida had never left Mexico before. She flew north with her husband who began work on a series of city murals. Frida became restless and lonely, so she began exploring the city, wandering narrow street markets, marvelling at pretty birds in cages and buying silk to make skirts. Friday was most definitely living in Diego's shadow but it didn't stop her from starting on a series of portraits that would one day make her famous. This small snippet of a great artist's life is lyrically written and utterly charming. 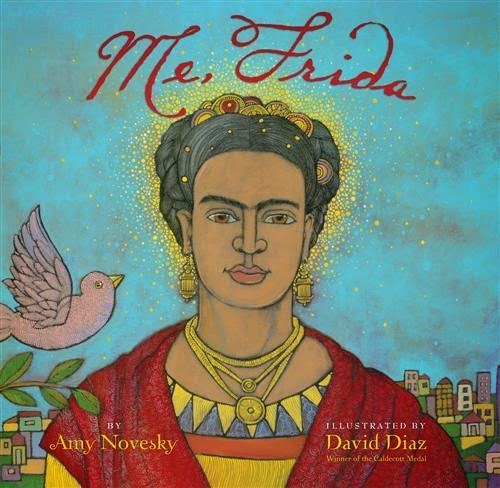 Illustrations by Caldecott Medal winner David Diaz, bring the colour and vibrancy of this astonishing and creative woman, alive.